Valorie Gallagher fell in love while vacationing along Mexico’s Riviera Maya. She’d been looking for her perfect match for years, and once they met, she instantly knew that her life would never be the same. This wasn’t the typical affair of the heart, however. 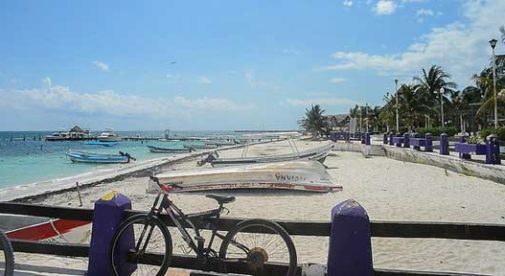 Valorie had fallen head-over-heels in love with one of the lesser-known jewels of Mexico’s Riviera Maya, the fishing village of Puerto Morelos. And 17 years later, she’s still in love with it. It’s not hard to see what drew her to this village of 12,000 people. 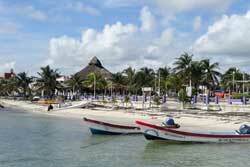 Puerto Morelos lies about 30 miles south of Cancun and claims several miles of spectacular natural beachfront. Temperatures most days hover in the 80s F. The water is warm and clear, its colors ranging from dark blue to varying shades of turquoise. The sand is light and fine as sugar, and the tropical waters host all manner of colorful fish, lazy sea turtles, and even migrating whale sharks. “I absolutely love Puerto Morelos. I can’t imagine living anywhere else. All of the people here are happy. That’s the truth. The locals and the expats get along like it’s just one big family,” says Valorie. And you don’t need to be rich to enjoy it, either. Valorie calls this village home for only around $600 a month. Puerto Morelos was the perfect fit for Valorie Gallagher, with its small-town feel and gorgeous beaches. “I have a nice, two-bedroom house with a fenced yard for my dogs, a modern kitchen and bathroom, washer and dryer, and a great landlord,” she says. “I pay less than $300 a month. I have a car so I can drive to the village or to Cancun with no problem. But if I didn’t have a car, I could take a colectivo (mini-van) for about three cents to the village. They run right through my neighborhood. My electric bill rarely goes above $25 in the heat of the summer, with my air conditioner running. “I’m from the mountains of New Hampshire, and I hate snow and cold weather!” she says, with a mock shiver. “So I spent my vacations shopping for my new home in Mexico. Her days now are as full as she wants them to be. “Although I’m old enough now to be getting my Social Security checks and call myself retired, I still choose to work. I help out my friend who owns a wonderful restaurant here. I just love being around the people. I see the same customers, year after year, who come for vacation. And, of course, there are the locals. We’ve become friends. I love to garden and help tend the gardens of friends. I keep my green thumb properly exercised that way. “I’m never bored. If I’m not at the restaurant or tending a garden, you might find me out on the reef with friends or guests. I’m also a certified snorkel guide here. The reef is only 500 yards offshore and it’s the world’s second-largest. The water is clear and you don’t need to dive deep—a snorkel is all you need. I always see tons of fish when I’m out there. And then there’s the beach. It’s world class and it’s right in my backyard.